Another Beautiful Day in Paradise. Well... we did have an East wind of 10-20 mph but it was sunny and in the mid 70's. 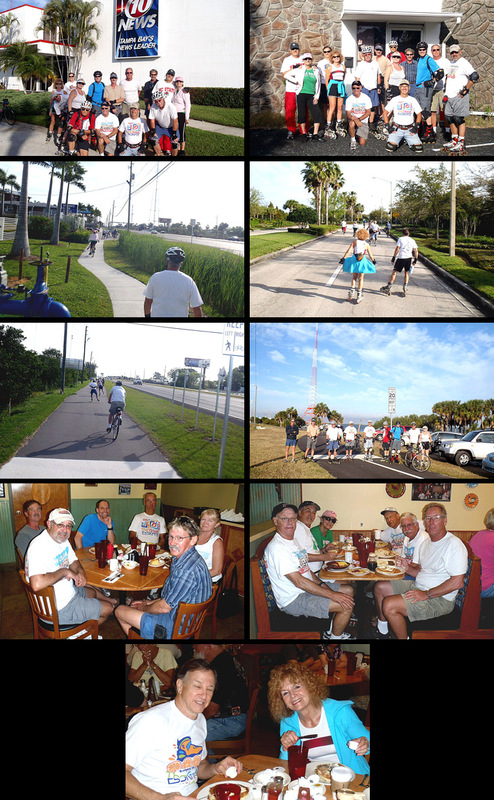 We ended up not meeting right at the Friendship Trail Bridge but a little West of it where the Gandy Blvd turn off was and where the asphalt trail started. You could park right next to the trail there. New skater/bicycler Andrew F joined us for the first time. Welcome Andrew. We took our group picture in front of the Ch 10 Gandy Blvd building which made a nice background setting. We decided to go directly to the West end of the trail which was Barneys, check out Ken Moody's business complex and then work our way back against the East wind. Doing the Trailer park and Condo complexes on the way back would help give us a break from the wind. We had distances measured from 10 miles to 10.5 miles so we'll take the average of 10.25 miles for the round trip distance. We had 5 bicyclers. We Brunched at Skyway Jacks II as planned. We got seated immediately at 3 tables close together. Skyway Jacks II was pretty busy. However they just didn't seem as organized as the 34th St Skyway Jacks and the food was okay but not as good as the 34th St Skyway Jacks. We had a range of ratings but none that great. We'll give them an 8.3. Unfortunately the group just wasn't in the Pool Party mood so we skipped the pool party. Maybe when the weather gets hotter.